Not everyone looks forward to the Holidays. If you grew up with a toxic Family of Origin (FOO), the Holidays bring on a sense of dread and depression. 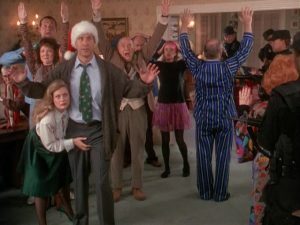 Nothing brings out the Funk in Dysfunction like forced family gatherings with the influence of egg nog. For me, attending holiday family gatherings meant that I would be squeezed back into the role of the rebellious black sheep. I would be reminded, publicly, of every infraction and violation ever committed (with great embellishment), have my flaws pointed out in the form of ridicule, and my significant other would have been bombarded with inappropriate personal questions and baited into religious and political debates that could possibly result in physical violence. Fun times! It wasn’t until my late thirties that I began making excuses for bailing on the family gatherings, and it would be a decade more before I finally came to realize that, in order to gain my sanity, I had to go complete no contact with my parents. Admittedly this was a tough choice to make. Firing your parents is not an easy thing to do. It’s not socially acceptable and it usually means that you also lose contact with extended family members who are still in the FOG (Fear, Obligation, Guilt) machine. Or the abuse they receive isn’t as intense, so they can live with it, and can’t understand why you won’t. 1) Avoid the large family gatherings altogether. You are never obligated to put yourself in abusive situations. Not even (especially) when the abusers are family. Instead, try meeting up with sane family members separately. 2) If you feel you must attend large family gatherings, have a plan to only stay for a short period of time. 3) The moment a toxic family member begins provoking you, politely leave without making a scene. Don’t allow yourself to be goaded into an argument. You didn’t get to choose your family members but you do get to choose, as an adult, to not take abuse. The Holidays should be a cause for happiness and celebration of peace. We at Crazybusters wish you a safe, happy and drama-free Holiday season. I ‘m also a scapegoat & black sheep as you ,and was always set up,for humiliation, even if I showed up at gatherings! Solution, was to move out of the country & avoid holidays period. At forced gatherings or at funerals, make it short & get out. And then they wonder why you’ve become distant.